It’s the $21 million question at One Buc Place that must be answered. Have the Glazers given up on Jameis Winston? Sorry, Winston-bashers, but the answer is no. They’re not eager to turn the page and start over with a rookie quarterback next fall. This organization has invested a lot of resources in the No. 1 overall pick of the 2015 draft. 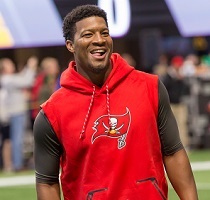 The Bucs stuck with Winston through his suspension and gave him his starting job back, even though Ryan Fitzpatrick had played well beyond expectations through 14 quarters and two wins. That doesn’t mean ownership balked at Dirk Koetter’s decision to bench Winston late in the third quarter in Cincinnati or to start Fitzpatrick at Carolina. Koetter made the right call. Yes, big decisions ultimately have to be made about No. 3, but the Glazers aren’t convinced this season is toast. That flickering hope overrides any desire to see whether Winston can finish the season strong. The simple truth: Fitzpatrick has outplayed Winston this year and he gives the Bucs a better chance to beat the Redskins on Sunday. 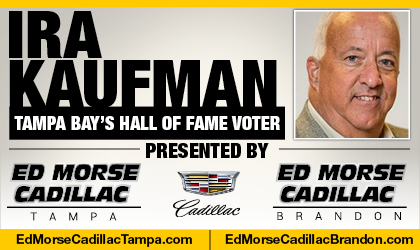 But if Tampa Bay loses, the equation likely flips. At 3-6, it would be time to look at the kids and return Winston under center for the remainder of the season. That’s what you do if you still believe in Winston. But if the Redskins win and Fitzpatrick is still starting the following week in the Meadowlands, the only logical interpretation would be the Bucs are done with Winston. You don’t turn your back on a guy you’ve labeled as a “franchise quarterback” unless you’re sure, really sure, that he can’t be rehabilitated. I just don’t think the Glazers are there. Not yet, anyway. The owners will ultimately decide Winston’s fate in Tampa. Not Jason Licht. Not Dirk Koetter. Not Mike Bajakian. If the Bucs finish 6-10 and the Glazers intend to sign off on a $21 million deal for Winston in 2019, any potential new head coach would have to share their belief that Winston might still be the man. 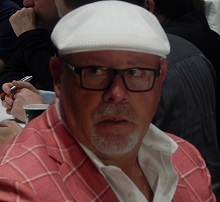 That’s why Bruce Arians, an unabashed Winston supporter, could generate interest as Koetter’s replacement. He also has a history with Licht. Koetter still has time to save his job. The next three opponents aren’t particularly daunting before Carolina saunters into Raymond James Stadium, but time is running out. The cruel irony of this situation is it would be professional suicide to bench Fitzpatrick if the Bucs suddenly embark on a three-game winning streak. In other words, a coach whose future was supposed to be linked to Winston now finds himself linked to Winston’s backup. Winston is going no where !! He is staying in Tampa Koetter will be fired he is not ready to be a head coach yet. Ariana would be a great head coach I wana go watch that season of him and cardinals on prime. This is not the way to run a professional organization. 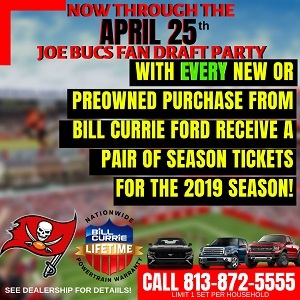 Apparently there is a different species in the Tampa area, the people who still cling to hope when it comes to the Soiled Messiah being our QB of the future. Let him go play baseball. Arians is not the answer. But he is smart. Leverage equals cash. He’s on record as saying he wants the Cleveland job. He has ties to Licht. He has spoken well of Jameis, and I’m sure the Glazers are hoping Jameis is just going through a rough period. Arians is Lovie Smith all over again. This is not the way to go. It is papercut number 951. Mr. Arians….two words….. Roberto Aguyao………….. Very well said IRA. I 100% and wholeheartedly agree with you with everything said. But like you said there is a strong lose-lose situation here. IF Fitz wins the next three in a row, it’s likely he starts against Carolina and perhaps beyond, which could spell the end for Winston. However, if we lose against Washington, consider the season lost but then at least we get to see what adjustments Jameis has made, if any, and if he is worthy of $21 million next year. Get ready, because these next three games could not only decide the fate of this season, but perhaps even the careers of Jameis Winston, Dirk Koetter, Jasom Licht and everyone else on the staff. Buckle up, because the fate of the franchise is up for grabs in these next three games. Here we go. Ira, you know who is most excited about Winston staying with the Bucs? Answer: the Saints, Falcons, and Stinking Panthers fans. Uber me this – If an employee is still a bumbling disappointment after 4 years on the job and even missed work because of poor personal conduct, why would you keep him? Ira, please don’t let the Joes beat you down. Bucs pay Winston the 21mil next year under a new staff. Then you can franchise him in 2020 if you still need time before the next contract. Bucs three game winning streak? Hell would freeze over first. No point playing Winston anymore this season. He’ll be playing under a new coach in a different system next season. Let Koetter wrap up his final games doing things his way and give Winston a fresh start under a new coach next season. A one yr 21 mil contract is nothing for a QB it’s the multiple year contracts that get teams in trouble. At this point, I just don’t care what they do with Jameis. They have 3 QBs and much bigger problems that are more pressing. I don’t think Jameis is worth $10 million and it’s not my money. If the money isn’t a big deal for them, they have another year to decide. If they don’t fix the front office, replace inept coaches and get some guys that can play defense, it doesn’t matter who plays QB. Pretty much over it at this point. He wouldn’t be worse than Koetter, but is that what it’s come to ??? Just being pleased to not be as horrid as the last guy ??? lets hope Fitz plays well and Winston is traded . Why would the bucs want Winston as the face of the team who nationally is thought of as having character issues and average as best? A really good GM paired with a President of Operations can make the right decision, with fresh sets of eyes and no emotional commitment to the current situation. I’m confused how people can say he is not worth 21M, is it your money? So Mike Glennon got 17M but Jameis isn’t worth 21? He is the best QB we’ve ever had and it’s not close. So what if he is only average? He is 24 and average, are we saying he has peaked at 24? That he can get no better? Are you older guys the same person as you were at 24? This is nothing more than people trying to prove they were right about Jameis Winston and being right to you is more important than this teams future. Matt Stafford, Phillip Rivers, Andy Dalton, Kirk Cousins, Matt Ryan are all guys that are just “average” to me but none of their teams are trying to run them off for a few bad games and these guys are all PAID! Jameis is every bit as good as them at age 24, with room to get better. I’ve been disappointed up to this point but I need to see Winston under a different coach before I’d throw in the towel. Goff looked like a complete bust his rookie season under Jeff Fisher but a totally different QB after working with a new coach that catered the offense to his strengths instead of trying to make the QB fit his system. This org paid McIceCream over 65 million since 2014, for what exactly? Djax gets 11mil, for what exactly? Allen, Curry, Unrein all overpaid, for what exactly? We even have the highest paid center and I think punter too. But Winston isn’t worth 21 mil? Glennon got 16mil from Chicago, for what exactly? Cam makes 20.5, Brees 27 and Ryan makes 30. So following this logic Winston should be making at least 31mil. Do you see what I did there? May take some brains so I won’t hold my breath. Winston’s drama torpedoed this teams chance for success and got everyone fired. If he had been available those first 3 games win or loss, we would have never had this QB controversy. Only because Fitz actually won the first 2 games we were supposed to lose and gave the regime some hope. When Winston came back it deflated the team. Had they lost/won those first games with Jameis to start the season, then the move to put Jameis in wouldn’t have been questioned. Another thing, with the fact that Jameis’s absence derailed the team, Koetter may have been able to make a compelling argument for his reason to stay. Jameis ruined this season, and got his coach fired. Try to argue that? Ira has taken up drugs in his later years apparently. He’s been around the league this long and knows what I’m about to say is FACT. If you QB gets to head coaches fired for not only his on the field play but his off the field shenanigans, he’s toast, he has to be or the Glazers lose the handful of fans left. You don’t allow your QB to get head coaches fired and then turn around and pay him 20+ million to be the job terminator. Koetter would have been fired last season if Johnny G accepted the job instead of going to Oakland. Hey Ira: this isnt 2003. Teams dont live and die financially anymore with 1st round busts. The investment in Winston isnt much. He’s gone after this season. I’m not the biggest Winston fan, but I would give the kid 21 mill if we got someone that is aQB guru next season. I still say 70% of Winston faults can be coached out of him with the right coach and load his contract for the future with incentives like acc %, td/into reason bonus. While there may be one or two who feel that way the vast majority wouldn’t care if JW was purple…we want to win. His skills have been overestimated. My only question to all these Jameis bashers is, why do you givery the benefit of the doubt to Koetter, who has proven to be clueless time an time again over Jameis when Koetter has not improved any player on this team? Why would the QB who is said to work with the most be an exception? Have you been impressed with how he’s handled the defense, or how’s he handled the running game, or how’s he handled the kick/punt returner job, or how he handled Swaggy Baker, or how he handled Doug Martin, or how he handled TJ Ward or how’s he handled Mike Smith or how he’s handling this diva WR? No let’s blame the player that’s been a winner his entire life over a guy that has screwed up everything he has touched while here. Brilliant! If Fitz wins, he stays……I hope for both somehow…..the Fitz wins and Jameis still gets an opportunity to start again……at least once to see how he responds from the lesson. Like taking something so stupid as He looks like a bust in the first 8 games of his career….yes I said 8 because the bust label started long before the season ended. Since the season is already over they need to play Winston to be sure one way or the other, a couple bad games isn’t enough. Character issues aren’t easy to coach out of him. That’s one problem. Leadership, the decision to draft Winston over Mariota , according to Licht and fox, came down to the team believing Winston was a superior leader , He was charismatic and vocal. He attracted a crowd and owned a room. That’s great but it’s not in any way shape or form leadership qualities. Hollywood celebrities have tons of charisma and no one listens to those knuckleheads except bigger knuckleheads. The guys in the locker room found out that Winston is a talker. You’re off-target about Winston’s leadership. He has led his team to victories at every level he’s been in. He helped FSU beat Clemson FROM THE SIDELINE in a game where he was forced to sit out. THAT is leadership, and he has it in spades. That said, Abraham Lincoln was a tremendous leader but it is entirely doubtful if he could’ve been a QB in the NFL. Winston has some weaknesses to his game for sure, but leadership isn’t one of them. The guys in the locker room love him but that doesn’t mean they all trust him to make the best throws. The two things are simply unrelated. I agree with you about his leadership ability in college. But the problem is that this isn’t college anymore. There’s not much room for debate on this specific point in time. Players and Coaches alike have openly commented on it and said it. There’s nothing that says He can’t become a leader in the future. He is not dealing with players the same age or maturity level as He did in the past. You can’t lead by simply making highly energetic pre game speeches. I thought it was insightful to hear the players comments on Fitzpatrick. They pin pointed things that Winston doesn’t have yet. There’s also actions to be considered and I’m not just referring to game time play. It’s about character and how you carry yourself when someone’s watching and when no one is. Again, college players are mostly the same age and temprement. Especially when looking at marquee programs like FSU. I want Winston to succeed and retire a Buc. But I don’t put blinders on and refuse to see that the player and the person have issues, some may be easier to fix , some may not be. I don’t believe that the decision on JW future is as cut and dry as most make it out to be. The Glazers are going to have to set the parameters on how they want to consider the decision. Then I believe that it will be much easier to proceed. Remember last year when all of the haters said Koetter, Smith and Licht would be replaced the next off season? Winston is going nowhere. Jason Licht is going nowhere. There’s a chance Dirk could be fired…but his offense has been highly rated. The smart thing would be a complete Defensive Staff turnover, extend Jason Licht 5 years, and give Dirk another year. They need to start Winston Sunday! If you haven’t given up on him that is what you do. Why let him sit the bench a minute longer if you still believe in him. Wake up Tampa Fans!! They aren’t going to make the playoffs this year guaranteed!!! The defense is the reason why not Winston. So Play Winston the rest of the year win or lose and then FIRE DIRK and get someone else in here that can coach and help Winston. COMMON SENSE!! One of the problems we have here in the area is we have a QB who plays very well 33% of the time, very average 33% of the time and very poorly 33% of the time. When you do the math, you have average but when you throw in the turnovers, which are the X factor, you now add losing to the equation. I have found that fans that believe in Winston use touchdowns and yardage to measure his success. What is more important is how many of those turnovers have effected the outcomes of games. Koetter has made the situation worse by the long developing passing game he believes in. A QB such as Matt Ryan can work in that offense because he sees the field so much better than Winston and he’ll throw slants or throw it out of bounds, whereas Jameis holds on to the ball and doesnt’ stay cool when there isn’t anything there. The Bucs have a huge problem in that they have a quarterback that needs a ton of coaching and mental changes to be able to compete with the other NFC South teams that all have quarterbacks that handle pressure much better than Jameis does. Wipe the coaches and GM off our boards next year. Hire tony Dungy as GM. Arians as HC. Let Arians evaluate Winston. Arians will get us a running game and not have Jameis throwing all over the place. He’ll throw..just not as much. And Arians will bring in a guy who knows Defense. He and Mild mannered father Dungy would get along just fine. Casey Morgan Says: Winston is horrible and I’m not a racist. You don’t need to let people know your not a racist just because you don’t like Winston. People who call people they don’t know a racist because they don’t like a person of color are the TRUE racist in this country. Don’t let them make you feel guilty because he is black and you don’t like him. Just and FIY!